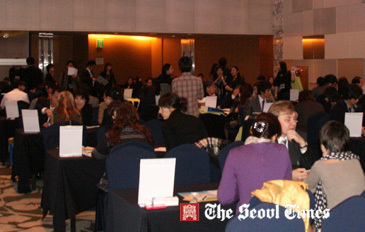 The Korea Tourism Organization (KTO) hosted the 4th Korea International Medical Tourism Convention from Nov. 9 to 10, 2011 at COEX InterContinental Hotel in Samsung-dong, Gangnam-gu, Seoul. The conference’s major events included seminars, hospital tours, job presentations, and international business rounds. Dozens of local hospitals and local medical services manned booths and provided demonstrations of traditional Korean therapies such as acupuncture and massage. The event was heavily attended by medical tourism agents from Russia, China and Vietnam looking to network and learn. Tischenko Nadezhda, director of the Vladivostok-based travel agency Nadezhda Travel Co., mentioned that "many Russians are rushing to visit Seoul to take not just plastic surgery but also to take various types of medical checks and surgery." One of the doctors from China, Xu Jung Feng, showed deep concern about finding high level hospitals in order to make MOU on that spot. Ksenia Gordeeva, an air tickets manager for Laguna Travel, a tourism company also based in Vladivostok, told The Seoul Times that this event was a good occasion to promote medical tourism between Russia and South Korea. She said her agency sends some 200 Russian students to Seoul for English language education. "It is cheaper and the quality of education is very high in Seoul," the manager said. "We plan to send more Russians to Seoul for medical tourism from now on." The event’s sponsors included the Korea Health Industry Development Institute, Financial News, University News Network, The Association of Korean Oriental Medicine, Korea Orient Medical Hospital Association and the Oriental Medical Tourism Organization.